Eat + Drink Where are the hottest Easter brunch specials in San Diego? We have them all right here! Before the Easter Egg hunting comes the hunt for the best place to spend your Easter feasting with your friends, family or both! Where to go for Easter brunch in San Diego? Check out all the amazing choices below! Herb & Wood is celebrating the one year anniversary of it’s renowned brunch with a four course Easter menu. Options include dishes such as Dungeness Crab Hash, Burrata and Crispy Prosciutto Toast, Shakshuka, and Bananas Foster French Toast…YUM! The menu also includes a pastry basket to start created by Executive Pastry Chef Adrian Mendoza, along with the choice of Strawberry Vacherin or Chocolate Pots de Creme for dessert. The pre-fixe menu costs $48.88, and a kids menu is also available for $15.99 including options like French toast and kids mini quiche. Reservations are recommended. One of our favorite North County restaurants, CUCINA enoteca Del Mar, will be serving Easter brunch Sunday from 10a.m – 1:30p.m with a delicious buffet & breakfast cocktails. Reservations T: 858.704.4500 Adults $49, Kids $19 children 12 years & younger. Price does not include beverages. Gather beachside at JRDN in Pacific Beach for Easter brunch with a view. Served from 9 a.m. to 3:30 p.m., we recommend starting off with their Jumbo Sticky Buns ($10) made daily by Chef Melody Yono and then spicing things up with their Chilaquiles + Eggs ($16) served with chorizo, guajillo chili salsa, queso fresco, pico de gallo, avocado and lime crema. Sip on their acclaimed Brunch Mary or build-your-own mimosa while you take in the ocean views. To make reservations for Easter brunch, please call (858) 270-2323 or visit their website. Indulge in dishes like Nutella french toast (pain de mie, hazelnut, maple syrup) and croque madame (bechamel, black forest ham, fried egg). On the lighter side are tartine options of avocado, tomato, radish and sprouts or smoked salmon with roasted poblano cream cheese, tomato, capers and red onion. Enjoy a leisurely meal seated on supple, coral hued velvet banquettes at the much buzzed about Jeune et Jolie in Carlsbad. Serving their classic brunch menu, standouts include the folded French omelette (boursin cheese, fine herbs), the brioche bostock (made in-house bread, almond cream, fruit), and beignets accompanied by jam and cream. Coffee by local roaster Steady State is served in mottled pastel earthenware, making your morning (or afternoon) cup serendipitously festive for Easter Sunday. Hippity hop on in for a special Easter Sunday Brunch! Chef has put together a menu of his weekend favorites, for a $20 2-course prix-fixe option. For an additional $10, make your own Insta-worthy You & Yours Spritz! Pick your Vodka / Gin, white or pink bubbles, then go crazy at the fixin’s & garnishes bar! Starting at 10:00am until supplies last. They will be open and serving Chef Ryan Johnston’s legendary spring brunch menu starting at 10am. Indulge in their decadent french toast (plums, figs, grand marnier, candied almonds, orange zest & whipped cream) or keep it light with their ultra-fresh take on avocado toast (with chili flakes on multigrain) or fabulous Spring omelette (asparagus, green garlic, goat cheese, & chives). Pair with their seasonal mimosa (Caribbean pineapple & lime) or their London’s Burning cocktail (Gin, Jalapeno, Avocado, & Lemon) and raise a glass to the warm days ahead. The belgian waffles are topped with a weekly array of fresh goodness, the cheesy eggs are served with gruyere and pamaragina, scallion, and crispy potato with the option to add brisket (definitely add brisket), and the steak and eggs come with locally baked Prager toast and thai bird hot sauce. While some spots ignore the -unch part of brunch, Campfire is not one them. For those that are not strictly team breakfast, they offer dishes like the camp rice bowl (forbidden black rice, pickles, fried egg, avocado, kale), turkey (tomato, pesto, sprouts, provolone, farm bread) and the bacon belly banh mi (mayo, carrot, jalapeno, cilantro, ciabatta). Sign us up. At The Crack Shack, you’re encouraged to loosen your collars and enjoy the lawn games, craft drinks, and fried chicken. Before anything else, try their newest menu item the BAE, featuring bacon, avocado, sunny side up egg and american cheese, all on an artisan English muffin from the best local bakeries. For a brunch minus the buns, there’s the Anti-Salad Power Bowl that comes with smoked chicken, soft boiled egg, heritage grains, chato’s salsa, avocado and arugula. And a pro tip: add a couple fried eggs to the Mexican Poutine for yolk-meets-fry heaven. Friday, April 19 and Saturday, April 20, 2:30 p.m. to 5 p.m.
Dine in exquisite Parisian style at The Westgate Hotel for their annual Easter Champagne Brunch. Gather round in Le Fontainebleau Room where guests will enjoy a gourmet brunch paired with champagne and Easter joy. Children will be treated with face-painting and a visit from Monsieur Easter Bunny himself. Reservations will be available from 10 AM to 2 PM and can be made by calling (619) 238-1818 or visiting Westgate Hotel activities online. From a poolside BBQ with outdoor movie and fireworks to three hoppin’ places to brunch and the Grand egg hunt, Fairmont Grand Del Mar is THE place for a long weekend of Easter fun! To help take full advantage of the egg-cellent fun all weekend long, book the Third Night Free package – pay for two nights and the third night is complimentary! This is where the kiddos can run off their Easter candy and parents can break their fast with a beer! An instant hit with the brunching-family crowd, the recently opened Gravity Heights in Sorrento Mesa will be dedicating their sprawling 5,000 square foot beer garden to a kid-focused Easter experience featuring an Easter-egg hunt for the littles, and a very special Easter buffet brunch. Mimosas (for $5 each) and their acclaimed list of house-brewed beer will keep the grown-ups happy. Festivities are from 10am-12pm and space is limited. Tickets for children and adults are $20 per person and available through their website. Brunch gets the deluxe treatment at Mister A’s, where staples like eggs benedict are elevated with succling pig, apple cider hollandaise and chicharon, all on a housemade english muffin. Not to mention the duck confit chilaquiles served with scrambled eggs, guajillo salsa, radishes and black beans. The ocean view restaurant boosts a food smorgasbord full or action stations and whimsical dishes. Guests can choose from items such as quiche, pancakes, breakfast sandwiches, a seafood selection of fresh shucked oysters, crudo, crab claws and jumbo shrimp, fresh salads and crudité, as well as action stations such as omelets, meat carving and dessert. The brunch buffet menu is $89 per adult, and $39 per child. Reservations required. Farmer & The Seahorse, in La Jolla’s Torrey Pines neighborhood, is offering guests the opportunity to celebrate Easter out in the sunshine with brunch on their gorgeous patio, perfect for the spring weather. The eatery will be serving up their delicious brunch menu with specialties like their irresistible Lobster Roll, along with some Easter specials and a few festive surprises, including an Easter egg hunt and Easter Bunny appearance for the kids. Reservations are encouraged. Make reservations for Easter brunch now for San Diego’s newest dining gem tucked away in Mission Hills. We recommend going with a group to share a little bit of everything but if you have to choose, try the Chicken Fried Quail and French Toast ($16) with hot honey, date puree and house-cultured butter or the Corn Beef Hash Benedict ($15) with poached eggs, cabbage, hollandaise, rye panko, and potatoes. It wouldn’t be an Easter celebration without some breakfast cocktails at Hundred Proof. Located in University Heights, Bar Manager Stephen Kurpinsky has artfully transformed cereal favorites into delicious cocktails. Kurpinsky’s Fruit Loops Ramos Fizz and Cinnamon Toast Punch will take you back to Saturday morning cartoons at mom and dad’s. Complete your brunch experience with Pastry Chef Jeremy Harville’s latest creation: Bananas Foster Baked French Toast ($12), buttermilk soaked brioche baked to perfection and topped with bananas foster and cream cheese ice cream. Brunch will be served from 10 a.m. to 2:30 p.m. on Easter Sunday. Stop in for brunch at Bankers Hill local hangout, The Corner Drafthouse on Easter Sunday. This casual gastropub offers comfort style brunch items like their Smothered Breakfast Burrito ($13.50) with scrambled eggs, drafthouse potatoes, applewood-smoked bacon, sausage chorizo, queso fresco, topped with salsa verde and Tennessee Hot Chicken ($16.50) with buttermilk fried chicken, poached egg, buttermilk biscuit, homemade sausage gravy, watercress, house-made hot sauce. If you can’t choose from one of their 70 taps, grab a bottle of bubbly on special for $15 during brunch. Easter brunch will be served from 10 a.m. to 3 p.m. Located in the quaint surf town of Encinitas, highlights from their Easter brunch menu include their Lump Crab Benedict ($18) served with two poached eggs, bacon, roasted tomato, spinach, shallots, hollandaise sauce on butter croissants and their Fried Chicken & Maple Bacon Waffle ($16) the name speaks for itself. Grab a seat before noon to get $2 off their Bloody Mary menu; each of which are served with a beer chaser. Brunch is available on Easter Sunday from 10 a.m. to 2 p.m.
Storyhouse Spirits is hosting a spirited Easter brunch from 10 a.m. to 3 p.m. House-made favorites crafted by Chef Nick Paulerio include Pork Belly Chilaquiles ($16) with house-cured pork belly, fire roasted salsa, scrambled egg, cotija cheese and cilantro lime aioli and Duck Hash ($16) featuring house-made duck confit, wood-fired scalloped potatoes and muenster cheese “hash”. Grab a seat early as this open air distillery, restaurant and bar has open seating where guests can soak in the sun and awesome views of the East Village. The East Village hot spot will be serving dishes such as Green Chilaquiles with tomatillo, avocado, chicken, cotija and crema, and Brioche French Toast with apricot almond sauce, mascarpone gelato and toasted almonds. The restaurant also carries lighter fare, like their Honest Protein Bowl with egg whites, avocado, black beans, grilled chicken and spinach, and House-Made Granola with Greek yogurt, mixed berries and honey. Price: Full menu available, dishes cost $8-$17. Brunch served from 8 a.m. – 12 p.m.
Eat local this Easter at The Local’s holiday brunch menu! Nestled in the heart of downtown San Diego, the restaurant and bar will be serving up springtime specials such as, Ham Quiche, Crab Benedict and a decadent Cinnamon French Toast Bread Pudding with a Grand Marnier Cream Cheese icing. Guests can also kick off their holiday with The Local’s famous brunch beverages, like the Local Mary, The Dude and Hot Cox. Easter Sunday reservations will be accepted, although they will not be required. You’ll be looking on the sunny side up with OB Surf Lodge’s oceanfront brunch views! The family-friendly waterfront restaurant is known for their deliciously sweet and savory brunch options including their Carnitas Benny with roasted poblano, avocado, jack cheese and ancho hollandaise. They are also known for their Brie Stuffed French Toast served with a seasonal fruit jam and toasted macadamia nuts. Brunch served from 8 a.m. – 3 p.m. 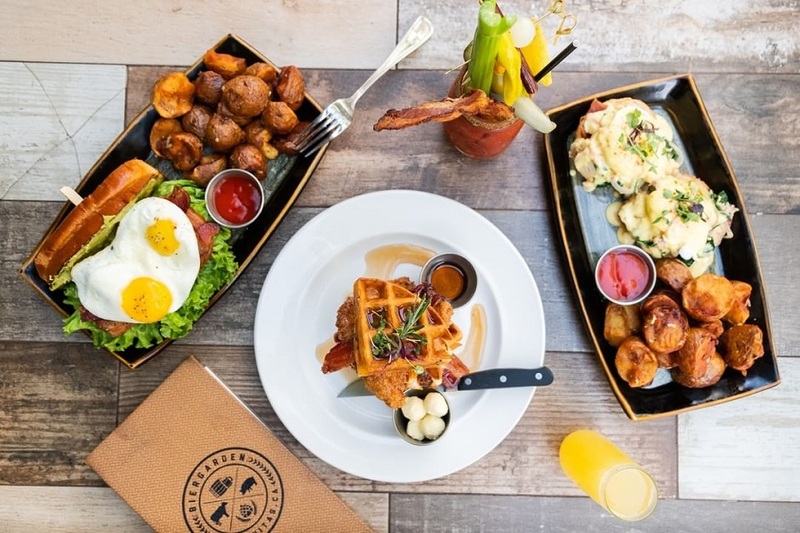 In addition to their regularly scheduled brunch featuring breakfast sandwiches, hearty hashes and a Skyy Vodka Bloody Mary bar, barleymash will also be offering Executive Chef Kevin’s specialty Black Forest Ham Steak & Eggs on Easter Sunday. From 10:00 a.m. to 2:00 p.m., come in to dine, drink and enjoy live music from local band, The Counterfeits, beginning at 11:00 a.m.
North Park’s Louisiana Purchase will be launching their brand-new brunch on Easter weekend! Guests can enjoy dishes like LP Sardou – a 4 oz steak over English muffin and cream spinach, topped with crab boil poached eggs and a Marchand de vin and bearnaise or an Open Face Jambalaya Omelet. The Southern-inspired restaurant and cocktail bar will be offering food and drink specials throughout both Saturday and Sunday. Keep an eye on Louisiana Purchase’s social media for more details leading up to the fun-filled weekend. Walk of Champagne Brunch will be paired with adult Easter eggs. We can’t say what sort of things you’ll find inside the plastic colored eggs, but for brunch you can look forward to gourmet biscuit dishes, like the Brisket Biscuit N’ Gravy, with eggs, caramelized onions, arugula and smoked beef brisket. Brunch also consists of sweet menu items like bacon pancakes, along with a handful of savory plates. And don’t forget the drinks – Irish Coffee, made with Jameson Caskmates, Dark Horse Coffee Roasters and whipped cream, is a great way to toast to the holiday! Indulge in an elegant Easter celebration at 20|Twenty Restaurant on Sunday, April 21. Executive Chef Julian Quinones will prepare a gourmet brunch buffet featuring a made-to-order omelet station, raw bar, carving station, freshly baked desserts and more. A children’s menu will also be available. Pricing is $85 for adults and $30 for children 12 and under. Tax and gratuity are additional. Reservations will be available from 10 am to 2 pm and can be made online or by calling (760) 827-2500. Would you rather stay home on Easter Sunday? Place a custom order at Patisserie Melanie for the perfect Easter brunch at home. Specializing in authentic French pastries, Chef Melanie is known for baking some of the best croissants and kougn-amanns in San Diego. New for spring are her Garden Macaron Collection which include elderflower, poppy, rose and violet. More spring pastries will be announced soon.